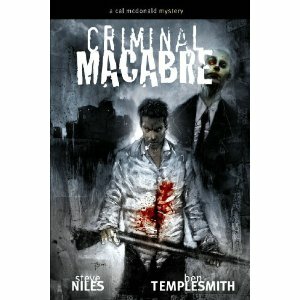 With a wild cast of supernatural characters, Steve Niles and Ben Templesmith’s “Criminal Macabre” has plenty of depth through issue one to make it a worthwhile read. If zombies, werewolves and zombies are your cup of tea, this series is for you. Add in the fact that the first issue of the series is free on Dark Horse’s digital comic app on the i-Pad and there’s no real reason why it shouldn’t be at least skimmed through. Helping matters even more is a unique look the duo perfected while working on the cult classic, “30 Days of Night.” while they are a bit rough around the edges, they call to mind the early work of Brian Michael Bendis in the way they lend themselves to the story. Simply put, this is a down in the trenches detective story and it needed grimy and industrial visuals to pull off its message. Considering that, Templesmith’s work gets the job done here. As far as the writing of Niles is concerned, it’s equally as simplistic at first glance, but surprisingly as enthralling as the visuals. Similar to “30 Days of Night” is the inclusion of vampires and a lead character with law enforcement experience, but that’s where the comparisons conclude. On its own accord, this issue is an enjoyable experience, solely due to the coolness of main character Carl McDonald. Edgy in a “Sam and Twitch” meets “True Blood” sort of way, his personality fits this hard-boiled noir adventure perfectly. With the reader confused as to why all the monsters have begun meeting up and McDonald just as puzzled, the search for answers is an intriguing one. While none are offered by the end of the first issue, the trail gets hot at all the right times, lighting the fire for what appears to be an adrenaline-fueled adventure.